Seen in London where treatments of royals and theatrical history fit the English bent for farce, Jessica Swale’s comedy, “Nell Gwyn,” was well-received. It showcases a woman known for her wit who called herself a “Protestant whore.” More than that, Nell Gwyn’s story is a true “My Fair Lady” tale. The Kings Company’s leading actor, Charles Hart, discovered her teasing his group’s members from an aisle where she was selling oranges. But instead of chiding Gwyn, he pulls her on stage. Hart saw her potential to become an actress and tutored her in current accepted mannerisms. While performing, she caught the eye of Charles II and became his long-time mistress. That said, Chicago audiences do appreciate a really good farce and well-presented historic tales but Swale’s play, now appearing at Chicago Shakespeare Theater in its North American Premiere, feels as if it isn’t sure what to emphasize and how to balance comedy with historical facts or how to play up the serious, indeed, ground-breaking, changes to women’s roles on stage and in society. Dubbed “pretty, witty Nell” by Samuel Pepys, Gwyn embodied the Restoration Theater period that came when Charles II was restored to the throne after England’s Cromwell and Puritanical years. He promoted French and Italian-style theater and wanted actresses on stage instead of men taking female characters. But given that Restoration comedy is supposed to be onstage, there seemed little point to turning Charles II’s Portuguese wife, Catherine, into a raving shrew. The Catholic queen was much maligned by Charles’ subjects. However, a reason to see the play is to enjoy Olivier Award nominee Scarlett Strallen’s delightful performance as Nell Gwyn. She dances, sings and flirts her way into viewer’s hearts as she bewitches the king (Timothy Edward Kane) and Hart (John Tufts). Chicago audiences will see local favorites such as Larry Yando (Goodman Theatre’s Scrooge) as Charles’ minister, Lord Arlington, and multi-Jeff Award-winning actor, Hollis Resnik, as Catherine and Ma Gwyn. British Olivier Award-winning actor David Bedella is perfection as Edward Kynaston who had to give up playing female characters. Kudos also to set and costume designer Jermaine Hill, augmented by CST wig and make-up designer Richard Jarvie. 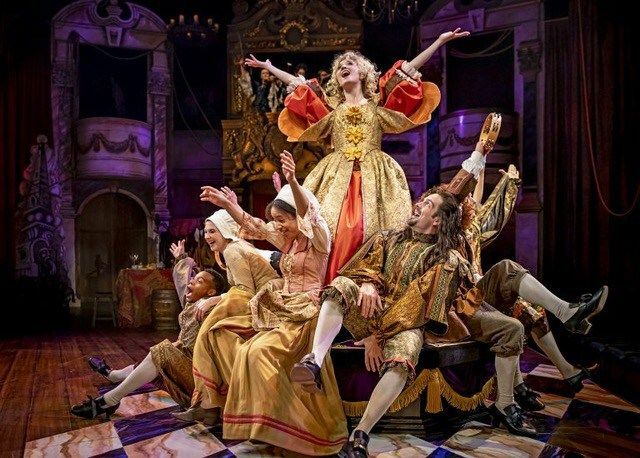 DETAILS: “Nell Gwyn” is at Chicago Shakespeare Theater, 800 E. Grand Ave. on Navy Pier through Nov. 4, 2018. Running time: 2 hrs. 30 min. with one intermission. For tickets and other information call (312) 595-5600 and visit Chicago Shakes.